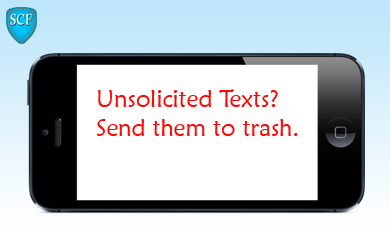 Steps to Protect Yourself from Text Messages (SMS) Scam. Latest Educative Article on Text Message (SMS) Scam phone call scams. The explosive growth of mobile communication across the world, especially during the last decade has created a huge community of cell phone users who are susceptible to fraud. Large cyber crime networks bombard mobile users across the world, with fraud txt messages asking them to call back a given number or go to a spurious website. The cyber crime networks are primarily run by Nigerian and East European criminals who have recruited franchisees in all countries and money mules to collect spoils of the scam, on their behalf. The fraud txt messages make the receiver to believe that he is lucky, while others are not! He is unaware that the SMS message has been pumped into the handsets of thousands of people, concurrently. The network waits for the gullible to revert and the expert thieves engage in continued brainwash of the hapless victim, till he or she is stripped of all savings. Stories abound about people who thought they were being scammed after paying small amounts but were convinced by the scammers to play along further and ended up losing big money. A large portion of txt messages is phishing attack where the potential victim is asked to go to a website (which could infect the users’ PC) and enter personal info, bank & credit card details. The criminals later mount attack on the user’s bank and credit card accounts. Always remember: scammers use names of well known companies, to trap victims.